I'm back to writing about Crete again today, this time with a photo of the Goddess of Myrtos from the Minoan period. I get excited about stuff like this because of it's age, to think that this civilisation existed some 4000 years ago - amazing! I only wish that I'd been allowed to hold or touch the Goddess, but it wasn't possible. 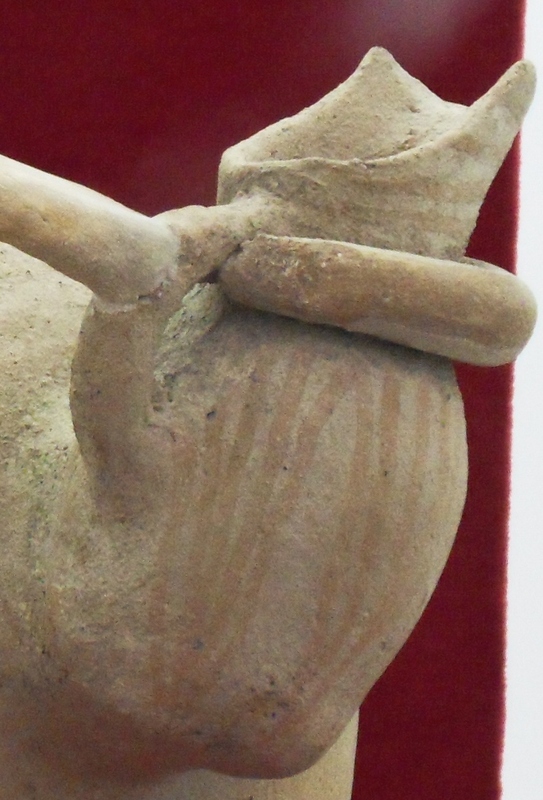 If we glance quickly at the photo above we'll no doubt think it's some sort of boring clay pot, but if we look more closely it's actually a woman holding a pot - and the woman is the goddess. 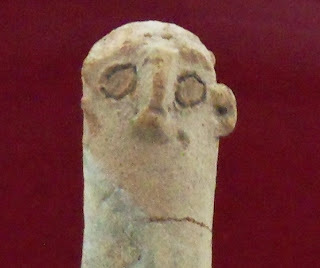 Okay, to our eyes she looks a bit strange with a very long neck, spindly arms and a bell shaped bottom half to her body. 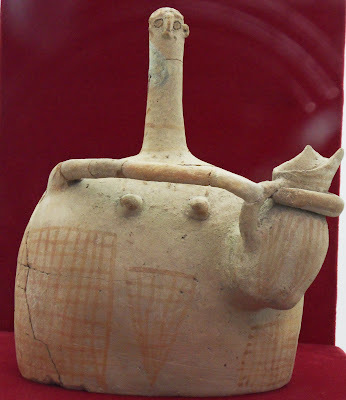 But she's all woman: breasts, pubic triangle and so on and she's holding a spouted jug, which is in the correct style from that period - 4000+ years ago. Archaeologists found the Goddess of Myrtos on Crete at Fournou Koryfi - an ancient Minoan site, now destroyed but with parts still visible. The Goddess is said to be a libation vase which would have originally stood on an altar, maybe a domestic one. Here's a few more relics from the Minoan period. Crete is an interesting place! Great photos. The goddess does look a trifle odd! But 4,000 years old...wow.